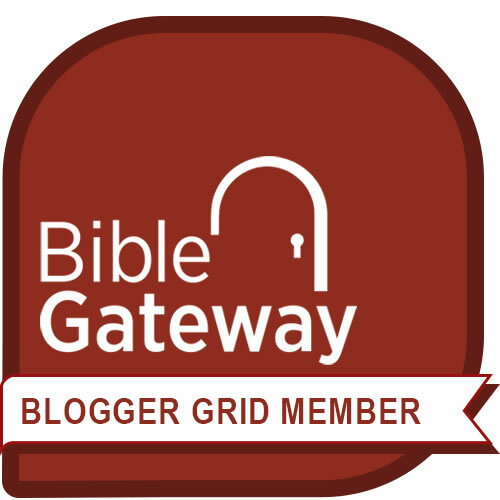 All kinds of illustrations are used in devotionals. A devotional illustration paints a picture in words, making a spiritual truth become concrete for the reader. They’re effective because you use details: names, smells, feelings, tastes, sights, numbers, facts. Jesus Christ was a master at using illustrations. His parables made a spiritual truth become concrete for listeners. Check out 8 kinds of illustrations he used and how he used them – so you can use them, too. 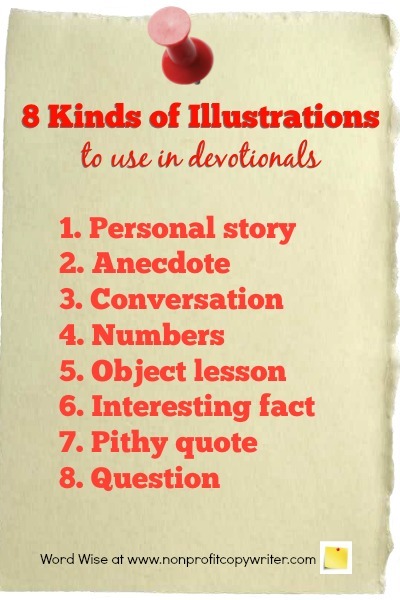 Personal stories remain one of the most effective vehicles for illustrations in devotionals — with good reason. You can share them with authority, from first-hand experience. For instance, Jesus described His encounter with Abraham. Jesus identifies the patriarch by name (a detail), how the patriarch acted (a detail), and his emotions (a detail.) The Jewish leaders didn’t believe Him, of course, but Jesus used His personal experience to make a point: He is eternal. “‘Your father Abraham rejoiced that he would see my day. He saw it and was glad.’ The Jews said to him, ‘You are not yet fifty years old, and have you seen Abraham?’ Jesus said to them, ‘Truly, truly, I say to you, before Abraham was, I am’” (John 8:56-58). While a personal story is about you, an anecdote is a story about someone else. The key factor here is to provide details. Jesus did this. His anecdotes – parables - were rooted in truth, drawn upon hundreds of observations and interactions with others: a dejected father, a persistent widow, an unrighteous manager, a rich fool. Have you overheard a conversation or have you been part of one that sparked a way to communicate a biblical truth? Jesus used dialogue as the basis for making a point about spiritual need. For example, people understand what it feels like to be sick and need a doctor. Jesus used that word picture in a conversation to identify human needs (Mark 2:16-17). By specifying needs, Jesus helped listeners understand their need for Him. Numbers, by their nature, are specific and detailed. You can use numbers and statistics to make a point. Jesus referenced numbers of sparrows and the numbers of hairs on your head. An object lesson uses one item as a visual or physical example of a truth. Recall your delight as you pass fields of wildflowers in bloom in abandon along the highway. It is a specific picture that is clear in your mind – one Jesus used as an example to explain God’s overwhelming provision. “Consider the lilies of the field, how they grow: they neither toil nor spin, yet I tell you, even Solomon in all his glory was not arrayed like one of these. But if God so clothes the grass of the field, which today is alive and tomorrow is thrown into the oven, will he not much more clothe you?” (Matthew 6:28-30). A news story, interesting fact, or intriguing how-to makes a connection to a spiritual truth in a way that captures your imagination. Jesus shared information about how a seed germinates in different kinds of soil (The Parable of the Soils) and how to plan a party (The Parable of the Prodigal Son) to make a point. A quotation can provide a powerful illustration of a scriptural truth. Jesus demonstrates here in a reference to the law of retaliation. “You have heard that it was said, ‘An eye for an eye and a tooth for a tooth.’ But I say to you, Do not resist the one who is evil. But if anyone slaps you on the right cheek, turn to him the other also” (Matthew 5:38-39). Jesus asked more questions than He answered — an excess of 300 questions in the gospels alone. Questions make readers think, helping her see different facets of a situation and go beyond simply looking at life in black and white.